Especially when winter is looming, I tend to prefer to stay in my nice, warm apartment and work on my own projects. But sometimes you have to remember that collaborative projects with other local artists can yield awesome results. Maybe someone out there has an idea for your own work you haven’t thought of yet, or maybe two cool things combined can make for something extra rad, and it’s worth stepping out of your safe bubble. I met local photographer Eric Baillies through a coworker/mutual friend when he took our portraits for our company website. Since then, we’ve done several really cool projects together. 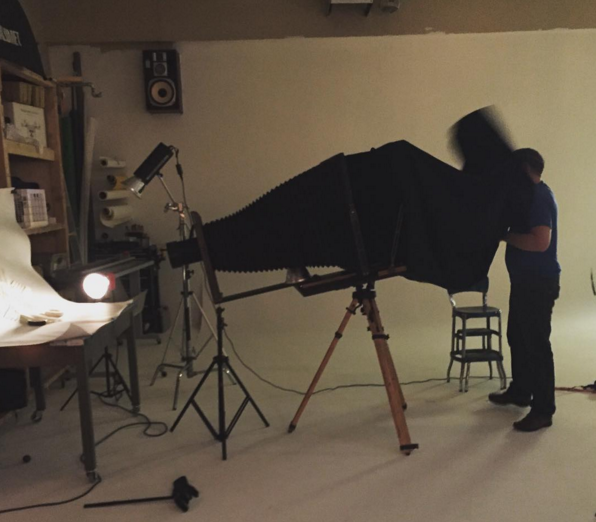 Eric does a lot of tintypes. 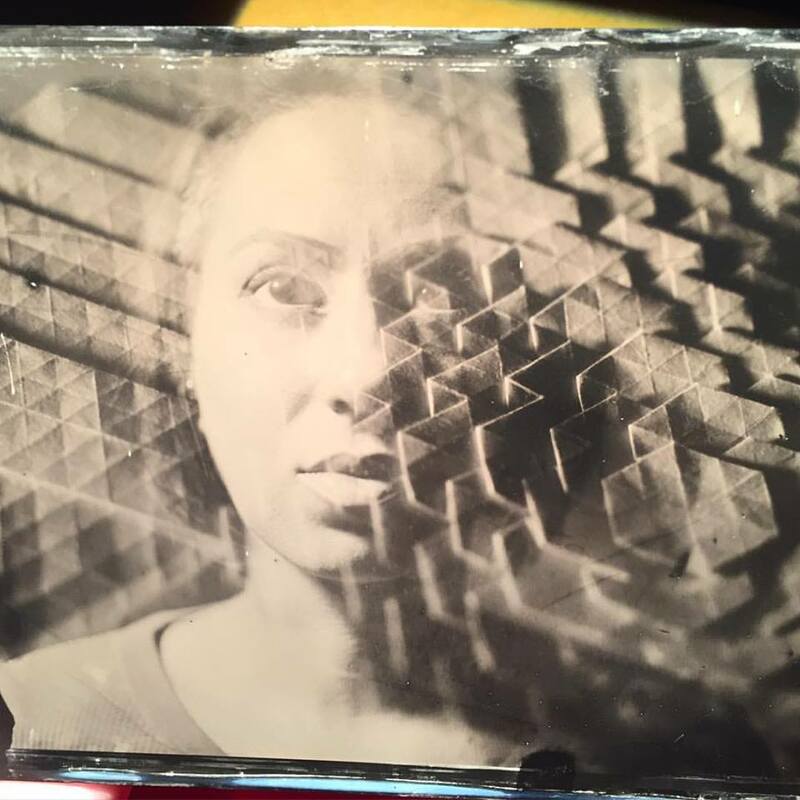 What are tintypes? 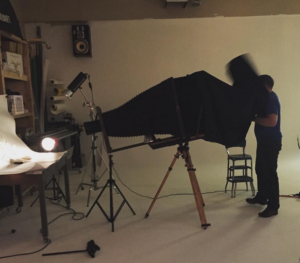 It’s a photographic process from the 1850’s. The finished photo is made of metal and lasts for generations. Last weekend, we shot this double exposure. It is 4 by 5 inches and was initially just done as a test shot before moving on to a 20 inch version, but I like it a lot. 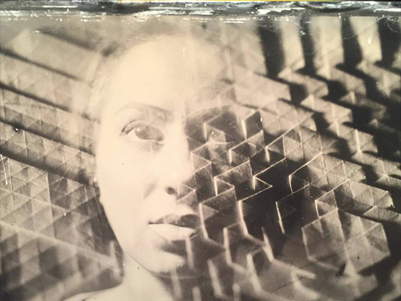 He first shot a rice paper tessellation I had made specifically for this experiment, and then he moved the camera and prepared the lighting for the side of my face. After that, he takes it into his dark room for some kind of chemistry involving silver and collodion. When he comes out, we submerge it in water and watch as the image turns from a negative into a positive before our eyes. I highly recommend the whole experience- seeing how the whole process is done (and how massive that old camera is) as well as being able to take away an awesome product you can keep forever or give as a gift. Check out more about him and tintypes here: http://ebaillies.com/topics/portraits/tintype, and wow your parents with a cool portrait this holiday season. He’ll even make you a case to present the photo appropriately.